Finally, we (Rudi, Michael, Matthias and I) were on our way to Eindhoven for the second European System Open Series event of this season. Last year’s SOS (main) events went rather bad for me (Hanover: 2:3; Bologna 0:3), despite having put a lot of thought in my squad list, match ups and so on. I wanted this season to be better. So, a couple of weeks ago, my team and I started regular weekly trainings, we used the Table Top Simulator a lot, did watch streaming videos, discussed current meta developments. We did our very first all-day training camp. Since our team has grown quite a bit during the last couple of months and expanded to another city, we had a lot of fun and were all eager to start the upcoming season. Still, recent smaller scale tournaments and local league nights did not give me enough confidence that this season should start off any better than the last. Plus, having spent the last days before the tournament with yelling at corporate lawyers at work, I was rather in the mood for a relaxed weekend. Winning a couple of games would be nice, but my focus would be on having a good time. So, the Wednesday before the tournament, I had a last training session with Matthias. We talked about possible match ups, including how to set up “Turn 0”, placing rocks, selecting target priorities and so on. This list is an absolutely stone-cold efficient list with a lot of potential to drive your opponent insane: pre-movement repositioning, both offensive and defensive modifiers (two each round), a huge jousting potential, well-adjusted squad point distribution. But it still requires a lot of training to keep up the precision flying; especially during a long tournament. When I saw all those top players from Germany, the Netherlands, Poland, the UK and other European countries registering in the morning, my hopes did not particularly go up. I thought: Let’s just have a few fun games and then do some Hyperspace flying on Sunday. I will spare you the details of each game and merely point out the essential win and loss conditions I had! Regarding my opponents: each of them was amazing and showed great sportsman (-woman) ship. Since the day went down in a blur and I can’t remember the names of all of them, I will just name the lists. 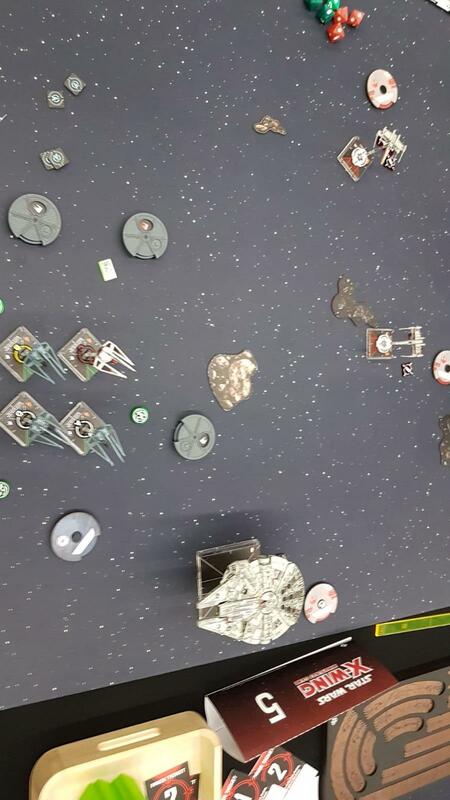 The first match started with the most anticipated list: a combination of four Rebel ships, usually including Wedge. Matthias and I had discussed beforehand what my ideal obstacle field should look like: a diagonal line in the middle (always be on the other side and force his convoy through the middle) plus two rocks on his side (Range 3 from bottom and Range 2 from left/right edge to force the convoy into pivoting the rock one turn later than she/he would have liked). The Phantoms would slowly roll up the field and engage him while the ships pivot around the first rock. 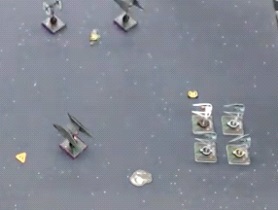 Target priority: take down the U-Wing before Leia could activate, then eliminate (Swarm Tactics) Wedge. It all worked out incredibly well. After three or four rounds of brutal engagement, two Phantoms with full health remained against Ten Numb and Dutch on half points remained. My first win of the day. The next match up did not necessarily require a specific rock placement in Turn 0. I just tried to push the rocks as far away as possibly to give my Phantoms enough space to candy cane around. 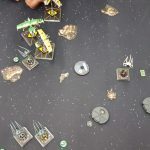 During practice sessions, I flew a lot against three ship (Aces) lists. Each game I lost happened for a particular reason: I was impatient and tried to use the Phantom’s speed to catch one of the Aces. This usually left space for the other Ace(s) to get behind my Phantoms and, therefore, cause trouble. Generic Phantoms are not Aces. Instead they should focus on their major strength: stick around in a tight corridor with possibly two board edges to their back and keep in mind that the opponent has come to them (because 12 red dice will statistically win over 9 red dice in a final salvo). Eventually, the opponent will make a mistake and get beaten down by the Phantom mob. The evening before the event, my team and I did a last practice match at the venue. 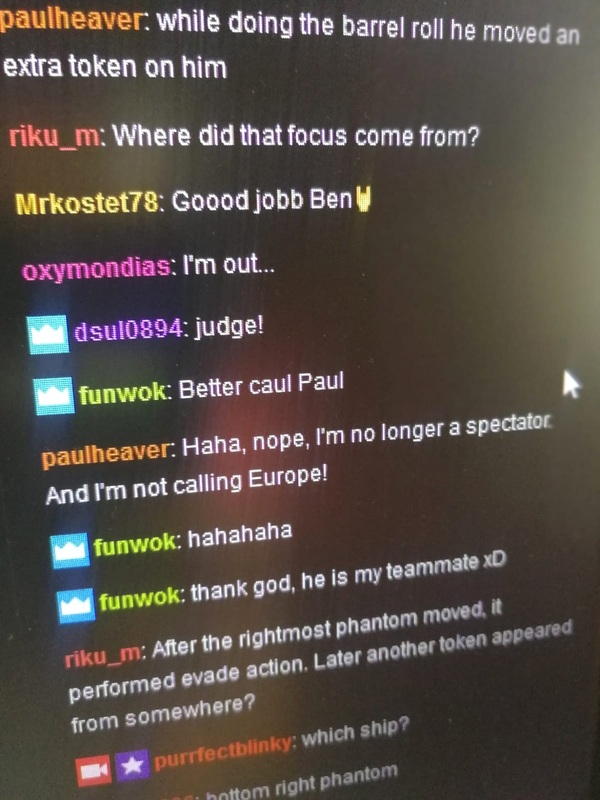 There, I had a conversation with a very nice Dutch guy about whether the crack shot on the fourth Phantom was better than having a one-point-initiative bid in case of a mirror match. I said: Come on, how likely would be a mirror match? Everyone’s playing Rebels. It turns out: likely enough. The very nice Dutch guy decided to set decloak blocks and shoot (and juke) first, which was very smart. It is hard to think over all the potential positions YOUR OWN Phantoms can have after decloaking. But it is excruciating to do this for 75 minutes for your own PLUS 4 opposing Phantoms who could deny you some of your options by decloaking first. I believe both my opponent and I wished to lie down after this match before Round 4. What was essential for this Round was something which is often forgotten: counting points, keeping the end game in mind. During the first engagement, my opponent took out my Cracker (which is how I will refer to my Crack Shot Phantom from now on. ), banking 47 points. In this engagement, I had two Range 1 and two Range 2 shots on his Phantom without Juke (46 points). Only one other enemy Phantom (WITH Juke; 51 points) was in all of my arcs, but in a statistically worse position (2x Range 3, 2x Range 2). The Round was far from over, but with 8 Phantoms on the table the planning phase takes particularly longer. Time would run out fast. I knew that the chances to kill only one of his Phantoms were really high at that point. So, I took the shots at the Juker and was able to take it of the board during the next round. The game ended 51:47, me not decloaking during the last turn and saving my three (shieldless!) Phantoms. 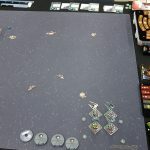 Another Rebel list, similar to the one I encountered in Round 1. I tried to apply the same strategy as in Round 1. It worked again. Rocks were in place. Braylen went down fast. Decloak blocks kept Wedge and Thane from concentrating fire and taking actions. 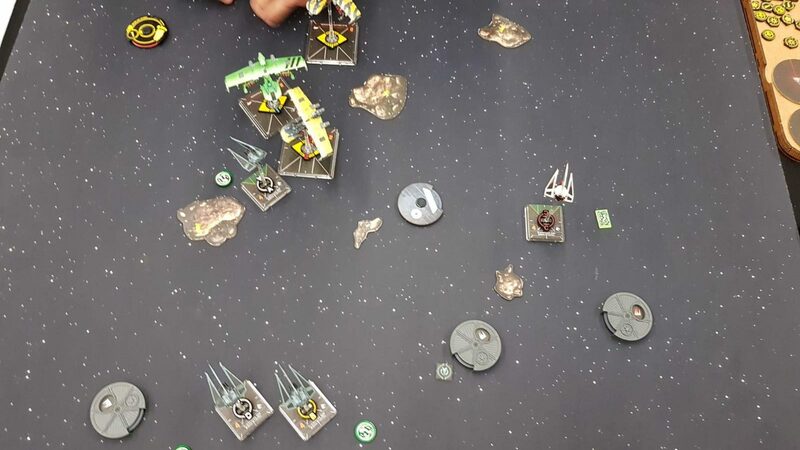 Cassian followed Braylen two rounds later, leaving Wedge and Thane with three angry Phantoms (the fourth had taken one Wedge torpedo for the team) which went to work. At this point, I was really amazed how smoothly it came all together and wondered when I would be thrown off my happy track. I was really glad to see this list so far into the tournament at the high tables. 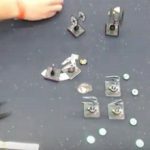 This is how far a Rebel Aces Build can get, all very cool ships with a lot of options. I could not believe that I had (almost certainly) reached the Cut. At this point, I had gone absolutely beyond my expectations. While my other two team mates had faced harder match ups during the day, a look three tables down the aisle showed that my third team mate, Matthias, did also go 5:0. Two times Squadrona in the Top Cut was just amazing! Amazingly (although not very improbable), Matthias and I got paired. Both our MoVs were fairly good, so we did not anticipate that the loser of this match would come in 16th or 17th (and therefore would have to do another Round to get into the Top Cut). You can re-watch us two idiots on “purrfectblinky” @Timestamp 09:21:00 on Twitch or [hopefully] later on Youtube. I lost this one, partly because I neglected one of my basic rules when playing aces: leaving the board edge behind and go after one of his Aces (Soontir). When I woke up this morning, I had a feeling similar to the German Nationals two years ago. Surprisingly, I had reached the Top Cut, more than I could have expected. Anything from there would be okay, also a loss in the first round. Also, I did not believe that I would be able to do the decloak/cloak-precision-game for another two or three rounds. My position in the Top 16 saw me paired with a list I did not anticipate at all (but which managed to be represented in the Top Cut three times): Quadruple K-Wings, all equipped with Barrage Rockets and – in this instance – 2x with Proximity Mines, 1x with Seismic and Sabine (!!! ), 1x with Proton Bombs. Because of the pairing system (1st after Swiss Rounds gets paired with 16th, 2nd with 15th and so on), I already knew what I would be up against the evening before. Because I did not fully know what to expect (except that those K-Wings would probably do a lot of hurt), I reached out to my team at home for advice. stay in front of them (because they throw stuff at you out the rear). 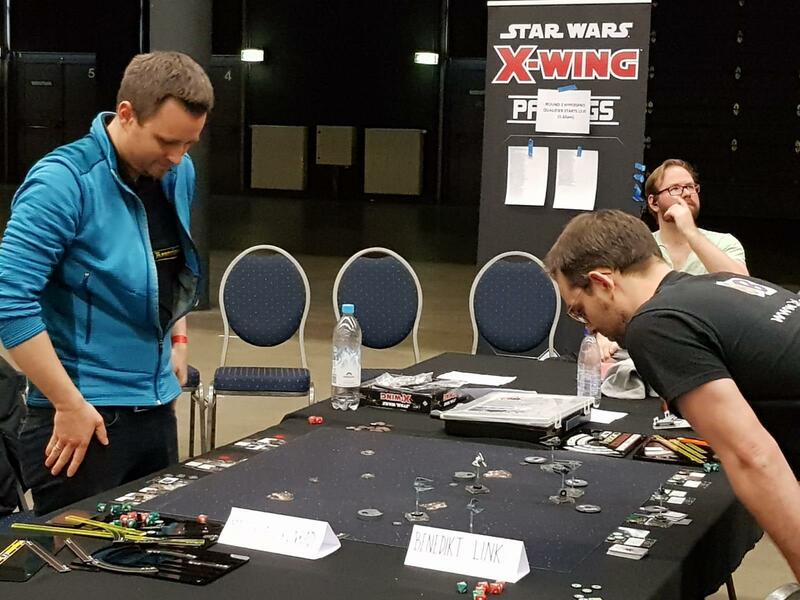 I knew Krzysztof from last year’s SOS in Hanover where he brought two Star Vipers and Fenn Rau into the Top Cut, totally disrespecting all those Nymranda lists. Basically, this meant that this guy was a very good pilot. I would not try and fail to do any fancy tricks, but stick to the only (four-part) plan I had. 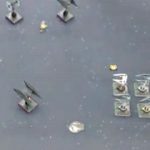 This turn, I took out an already slightly damaged K-Wing. During the next rounds, my Phantoms successfully dodged three Proximity Mines and two Seismic Bombs (although in one case by less than half a millimeter). 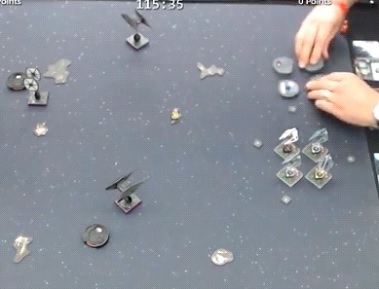 When only two K-Wings on half points still faced all four Phantoms, Krzysztof conceded. Another four-ship Rebel build with which I felt – in theory – quite comfortable. Still, Jaroslav had just destroyed Quadruple K-Wings with it, so I stayed alarmed. At this stage, I was already too tired to try anything innovative, so I placed my rocks and let my Phantoms sit in a corner until the first Y-Wing ventured through the asteroid belt and quickly went down in flames. In the end, the three Phantoms remained, taking out a fleeing Wedge. Looking at the Top Cut Brackets this morning, Matthias and I had joked about seeing each other again in the semi-final. Despite both being really tired, we were really happy that – no matter the outcome of this Round – a Squadrona pilot would be in the final of this System Open. Again, since Matthias will also do a detailed report of this match, I will sum it up for you in three sentences: Since I stuck to the plan of not trying anything original and staying put, the first shot was fired 45 minutes in the game. One stupid mistake almost cost me the game, two shots (half points on Soontir, half points on Duchess) brought me back. Me entirely not decloaking during the last round (see picture below) resulted in a 30ish % chance of Matthias not getting half points on one of the remaining Phantoms. Enough for me to get to the final table. were my thoughts when I took my things to the final table. My opponent, Lukasz Golonka, had managed to fly a First Order list up to the final table, a fact that I am still very much admiring. I knew Lukasz only from streaming videos from major tournaments, an interview on the Mynock podcast and tournament results published on listfortress (and its predecessor) , usually with him listed in the Top Cuts or as the winner. Basically, absolutely above my skill level and prior achievements. 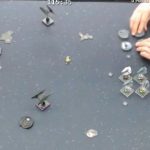 Having just played against an Aces list, I expected the final to last very long. He would have to come to me at some point, but – since it was the final – he had two full hours to do so. There was a vast, rock-free space in the middle of the board. I set up my Phantoms in the middle, dialling in a 1 bank to the left (which would allow all of my Phantoms to decloak 45 degree towards the board edge if I did fly them properly the previous round). 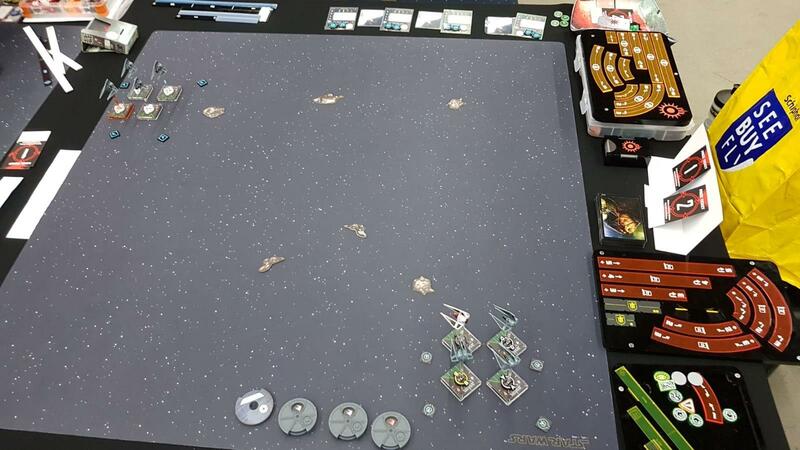 Lukasz’ ships were evenly distributed with Kylo standing almost in the middle and Blackout in the far corner of the board. While I was still fiddling with my Phantoms, I agreed that Lukasz could also start with his ships. I barely saw how quickly Lukasz moved his two Silencers 5 forward. Kylo even boosted further, directly towards my Phantoms. Shots in the first round of the game. I was profoundly shocked. Kylo did nothing to my Phantoms, but he had to spend his force in turn. Maybe it would not take us the whole two hours. The next two or three turns could potentially decide the outcome of the game. Kylo would go left with no chance of getting behind me. I expected Scenario 1, so I dialled in yet another 1 bank for all of my Phantoms to get parallel to the board edge after decloaking. Kylo might be gone, but I would have enough space to do all the candy canes (decloak to the side, followed by a 1 hard turn inwards) I wanted. 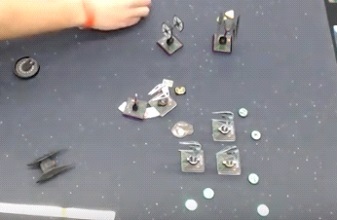 Kylo chose Scenario 1, but since he was standing at a 45 degree angle, his 2 turn put him in an unfortunate angle right in front of all my Phantoms. Being at Range 3 to most of them, I could only take one shield off of him, while my Phantoms lost three shields to the Silencers. The Cracker had to spend his Evade token and remained not cloaked. 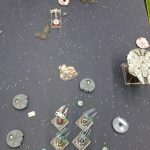 if played right, I could take Kylo off the board – if not, I would possibly never see him again. put the Cracker right next to the rock (blocking both the 1 and 2 hard turn to Kylo’s left). The Cracker took some serious damage, but lived (and should live two further rounds). Kylo, in turn, took some serious beating and remained on one hull with a Panicked Pilot critical damage assigned to him. The next round saw my Phantoms comfortably take a candy cane to the left to finish of Kylo while the Cracker ran for his life. With the Supreme Leader being gone and my Phantoms in a perfect position, Midnight and Blackout would have it very hard to turn this match around. This all happened way so fast. We were only 23 minutes in the game. Plus, Lukasz turned out to be one very relaxed, funny and fair opponent. We were definitely both tensed, but the whole atmosphere of the game was just amazing. “There should be a Focus token”. At this point, I was too tired to question this kind hint from my opponent and put it there. 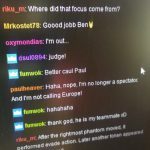 Apparently, the streaming chat went crazy at that moment, with no other than Paul Heaver himself pointing it out. I am really glad that this mistake did not make any difference at that moment. Blackout went down, Midnight followed him a turn later, leaving me as the winner after 45 minutes. Somehow, I had made it. It took us some time to realize what happened this weekend. Matthias and I had an amazing run, our only defeats being against each other. Since we are only at the start of this season, we are very much looking forward to the other SOS and Hyperspace Trials. Tournament performance is obviously also influenced by factors other than personal skill. Mental and physical state, match ups and even improbable dies also have their effects. Nevertheless, we have the feeling that this tournament season might indeed by a Squadrona Operating System!